Despite having photographed quite a few layouts last week, I somehow only managed to actually post one. That's how things get around here when Paul is home. Seriously - when he's home from work I get nothing of my normal routine accomplished. He's going back to work for a week tonight though (sad..) so I'll be able to hopefully get lots and lots of creating done! 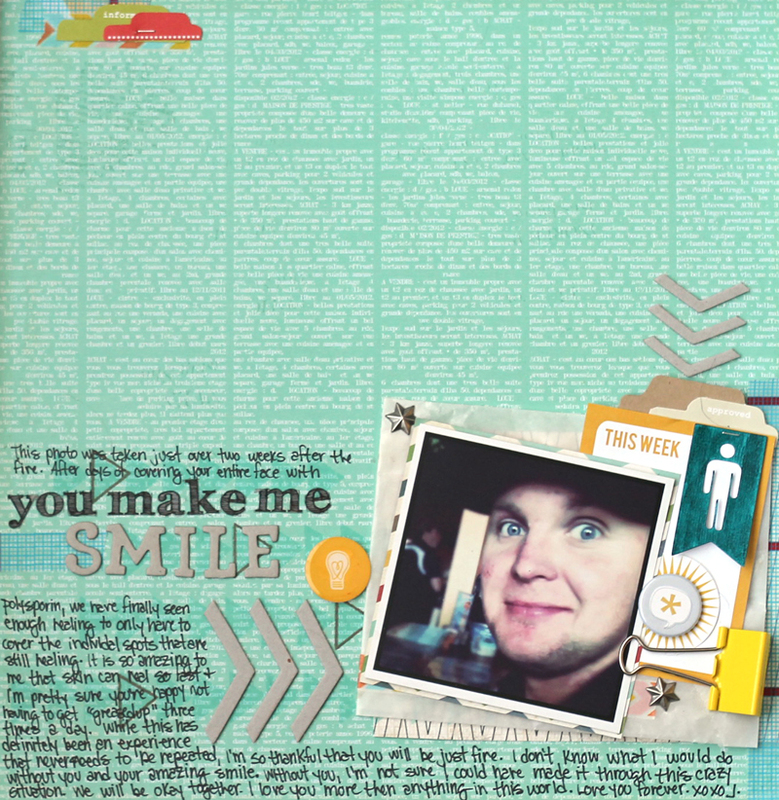 The layout above was created using a combination of Studio Calico's September Kit, Central High, and the add on, Style Guide. There's also a few pieces from the Pop Off The Page Class Kit in there too (namely the "this week" card and the bright yellow clip - that I totally looooove!). The arrows are actually the hexagon chipboard outlines that were in the Style Guide Add On. I just cut them at every second corner and ended up with three arrows per hexagon. I have no idea what to do with the full blown hexagons! There's lots and lots of journalling on this page - lots for me anyway. I usually like to stick to the titles holding all the meaning for me but here I felt I really needed to get some things out. Journaling reads: This photo was taken just two weeks after the fire. After days of covering your entire face with polysporin, we have finally seen enough healing to only have to cover the individual spots that are still healing. It is so amazing to me that skin can heal so fast and I'm pretty sure you're happy not having to get "greased up" three times a day. While this has definitely been an experience that never needs to be repeated, I'm so thankful that you will be just fine. I don't know what I would do without you and your amazing smile. Without you, I'm not sure I could have made it through this crazy situation. We will be okay together. I love you more then anything in this world. Love you forever. xoxo - J. That's all from me for now. Paul is packing things up to head back to work so I'm gonna go snag some more quality time with him before he heads out! What a great layout, I also love the orange background one below, with the amazing silhouette cut. You got this down girl. This layout is so awesome! I love all the layers behind the photo. Especially that vellum (glassine?) envelope(?). Lovely...and what a nice story and a nice sentiment. I think this is a layout you will love & appreciate years down the road. Also...so much for sticking to white backgrounds! Are you branching out!?!?!? HA!